with the big fall all supports till nifty 8000 also get broken so if now there is a fall ; nifty could resume its fall down to 8000 ? 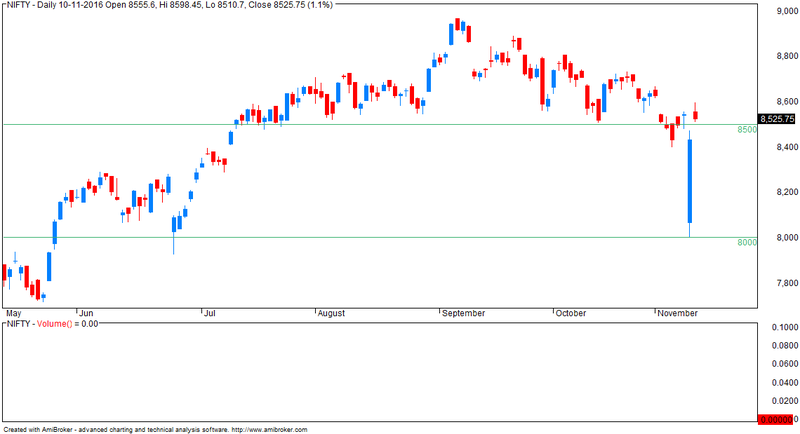 Let's see... close below 8500 is required. rising with islands..so falling will be with islands..Any comment sir? A 30-50 point gap down opening is required... I don't see that happening. Dear sir Banks constitute about 40% of Nifty weight.Due to demonetization they would attract huge low cost deposits which would have a significant effect on their profitability. so bank nifty would uplift the Index. I don't think so... the money people are depositing now will be withdrawn in few weeks. At 8500 if option writers do not expect 8000 to break, it means they are expecting a correction... this is what I am reading. If they 8200 not to break, then highest OI will be at 8200 put but this is not the case.